The end of the 1998 Drum Corps International Tour Tour was one of the more exciting ones in DCI's four-decade history. While the Cadets of Bergen County won at the Finals, the corps was 3rd in Quarterfinals and moved up to 1st in Semifinals, where Santa Clara Vanguard and Blue Devils tied for 2nd. Cadets' "Stonehenge" show was purely abstract, musically and visually, and included one of my favorite color guard routines, an-ever-changing color spectrum of flags that rippled back and forth. Santa Clara Vanguard showed us Aaron Copland's lesser-known side as a modernist and Blue Devils introduced the female lead from "Romeo and Juliet" to the streetwise Tony from "West Side Story." The Cavaliers celebrated their 50th anniversary by demonstrating a traditional color guard handing the reins to the contemporary guard. Glassmen jumped into 5th place, after falling out of the Finals two years prior, while Colts grabbed the coveted 12th spot after a 13th-place finish the year before. Blue Knights' ninth-place "Masters of the Symphony" led us through a music appreciation class in the history of large-scale western symphonies, in reverse, as if we were traveling backward in time toward the moment when Beethoven threw open the orchestral doors and greatly expanded the numbers and instrumentation of a symphonic orchestra. The show started with the brooding first movement, "Moderato," from Dmitri Shostakovich's "Symphony No. 10." The symphony was premiered in the Soviet Union a few months after the death of brutal Soviet dictator Joseph Stalin, whose ironclad rule was responsible for the death of untold millions of Shostakovich's fellow citizens. Mysterious and foreboding, the introduction was disturbing in its gloom and pathos, building to a tragic climax that led into the terror and ferociousness of the second movement, "Allegro." The composer was quoted in his memoir that this movement, with its ever-interrupting military drumming, depicted the wrath of Stalin's regime. Although musicologists debate whether Shostakovich was properly quoted, the fury of the music was more than apparent in the robust forceful delivery provided by the horns and drums. 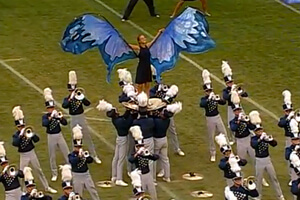 Performance excerpt of the 1998 Blue Knights. Discount DVD offer ends Monday, Sept. 17 at 8:30 a.m. ET.